This paragraph gives a brief idea of how to play go, but the full story is not much longer. Two players put stones at the intersections of a 19×19 grid. Once placed, a stone does not move unless it is captured. The object of the game is to surround more space than your opponent. Space is defined to be empty intersections and stones. A simple capture rule determines who is surrounding who. Repetition of position (due to interlocking captures) is not allowed. As for a taste of strategy (as can be seen in this Demonstration), typically at the beginning of a game players like to play in the corners because a corner has two natural walls. As the game progresses the sides become interesting because a side has one natural wall. The center is useful for connecting groups that become unstable because of fights in the corners and sides. 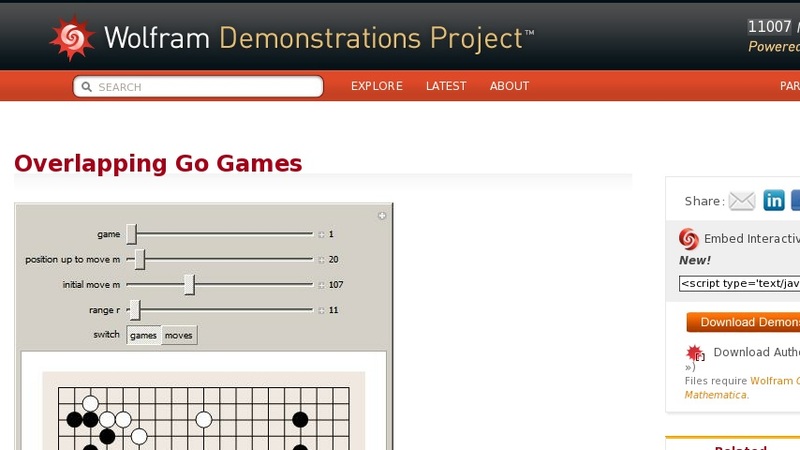 This Demonstration shows 100 professional go games. You can play through any one game (but captured stones are not taken off the board, as they would be in a real game). You can also see all 100 games at once over a variable range of moves, the ... moves starting at move ... . In that case, a darker disk indicates a higher frequency of moves at that intersection.